What every woman needs to achieve success, in my opinion, is to have a "Man of Steel" that inspires her to be a better person. That's what Superman is for. As a living "solar battery," I will absorb solar energies and convert them for fuel and power supply for all homes all over the world. I will emit "ultra solar rays" so there will be no more dark and dangerous places on Earth. Faster than a speeding bullet and able to leap buildings in one bound, I will use my superhuman strength and speed to help people in need. I'm basically the ultimate shield of mankind, invulnerable and have the immunity from all kinds of ailment with a recuperative powers, and I will use it to treat and heal people who are suffering from life-threatening diseases. Being beyond the genius level, I will use it to discover new technology as well as medicines to cure people with severe illnesses. I will use these powers as a sort of gift that brings with it a responsibility to help others. Best of all, I will use his heart and compassion to express my deep love for humanity. That, to me, is his greatest superpower. How about you, guys? If you could have the powers of MAN OF STEEL, how would you use it? 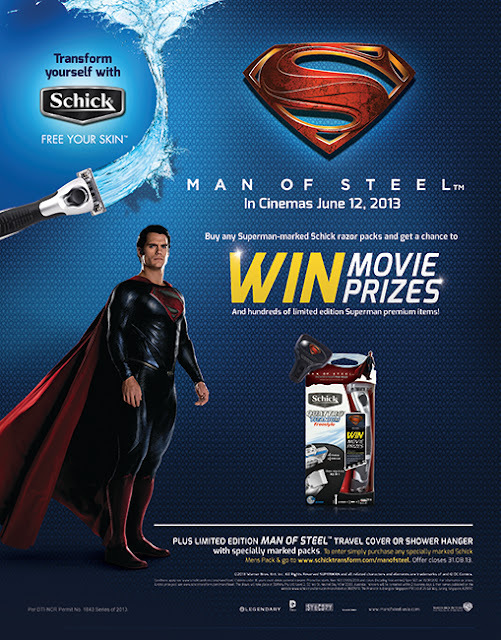 Dish out your opinions or answer and join Schick’s Superman promo contest to win movie tickets! Discover your powers and transform yourself with Schick. Free Your Skin. Wow superman movie tickets! i will join this contest! are offering, including all the important details and associated costs. A real estate transaction comes around in a time tested manner. what makes the most sense for you.